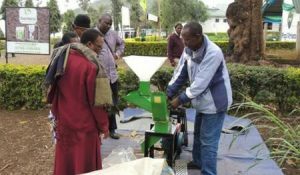 Improved agricultural technologies by the IITA-led Africa RISING project attracted lots of attention and even won awards at the recently concluded nane nane agricultural fairs held in Arusha, Morogoro and Dodoma, Tanzania. The nane nane agricultural fairs are held in different cities in Tanzania annually to recognize the important contribution of farmers to the national Tanzanian economy. The fairs which are usually very well attended are also aimed at promoting the uptake of innovative agricultural interventions. This year’s events took place from 1 to10 August. Festo Ngulu, Africa RISING Babati coordinator noting down information given by Paskali, a farmer from Mananga village-Babati who was interested to be engaged in project’s activities and ready to offer a plot of land for demonstration activities in his village. Technologies exhibited by the Africa RISING team in both venues were on the following broad areas: crop management efficiency (mineral fertilizer application); improved seed varieties; maize lethal necrosis management; forages for livestock feed and landscape conservation; vegetable integration for dietary diversification and income generation; post-harvest, nutrition and mycotoxin management; and mechanization technologies (for maize shelling and livestock fodder preparation). Participants and organizers of the events ranked the Africa RISING exhibition pavilion in Dodoma as the best overall during the week-long event. Over 1,918 farmers and stakeholders visited the booths and got the chance to learn about technologies and research activities that the projects implement within the country. “I am impressed by what Africa RISING is doing in engaging farmers and other stakeholders in the semi-Arid areas of central Tanzania to resolve their crops and livestock production challenges in a participatory manner. This approach will make improved agricultural technologies to get disseminated quicker to many farmers who attend to nane nane exhibitions,” noted the Deputy Minister for the Ministry of Labour, Employment and Youth Development, Anthony Mavunde, when he visited the Africa RISING booth. Ali, a beneficiary farmer from Matufa village-Babati demonstrates how the forage chopper machine operates. “This machine can really help in significantly improving the health of young babies in my village!” said Monica Michael, a farmer from Kigugu village in Morogoro after seeing a demonstration of the flour fortification machine being promoted by Africa RISING. Sarah Mwakimi, another farmer from Arumeru in Arusha was on the other hand very intrigued by the motorized maize shelling machine. “I need to get this machine; it will simplify for me the huge task of maize shelling. All children are away from home, I always experience challenges during shelling as the casual labors are drunkards and usually disappear for days when they get their first pay,” she noted. 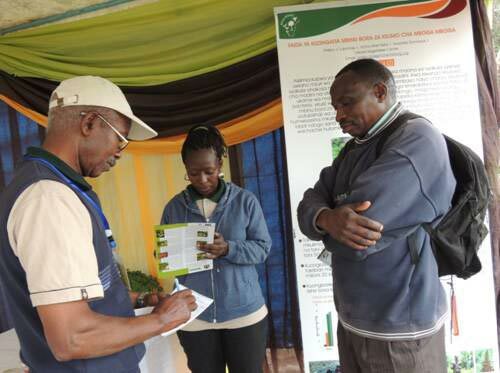 The exhibition team also took the opportunity to create awareness about aflatoxin contamination and how the Aflasafe technology can be applied to stop contamination. This activity especially drew special attention from the farmers after a recent incident where 14 persons died in Dodoma region due to aflatoxin poisoning. This is the second year in which the Africa RISING project team has held exhibitions at the event. The team intends to continue taking part in future agricultural fairs as a means of scaling out new and improved agricultural technologies and knowledge to farmers in Tanzania.